Having been fortunate enough to cross the pond for SxSW a couple of times, I got a surreal case of deja-vu when I arrived at Coventry Central Library on Saturday night. In Austin, seemingly every available venue than can host live music is utilised and I saw gigs in churches, restaurants, shops, cook-out BBQs, and even front rooms. Entering the library felt just like that, just in the midlands not Texas. Anyway, up three or flights of stairs to a floor, filled not unsurprisingly, with shelves and shelves of books. A stage had been set up in the middle of the room and a small trestle table sold bottles of water for a pound. There was no bar, no support, and positioned between large print fiction and reference tomes, not a whole lot of atmosphere either. Given the above, you would think the odds would be stacked against Dublin’s Fontaines DC, our favourite discovery of last year, but thankfully the room quickly started to fill, the band clearly on the radar of Coventry’s alternative kids too. They took the stage in a suitably low key fashion, tuning up, hopping off the stage and then a few moments later drifting back on again before being joined by frontman Grian Chatten. Between songs, they are a band of few words, and Chatten prowls the stage nervously looking for all the world like one of the caged big cats at the zoo that endlessly circle the outer limits of their enclosure. He didn’t have much in the way of space either – it wasn’t a large stage – but nevertheless he made the best of it, pacing back and forth, plucking at his shirt, his lip, his hair, eyes roving restlessly over the now full audience. Each time a song starts though, it is a completely different story. All the nervous energy, agitation, restlessness and adrenalin are channelled into a series of snarling, ferocious blasts of pure punked up rock’n’roll. Big is a snappy, jackhammer of a tune, and the savage put downs of Chequeless Reckless is an early highlight. Sha Sha Sha is a too-short, visceral slab of proto-punk, while Liberty Belle with its opening line “I love that violence that you get around here” just ups the ante and the bar even higher. On through the slower Lotts, and almost Joy Division like TV Screens, and even despite the muddy sound (as the library dispensed with any notion of “quiet please” by turning the volume up way past eleven to distortion levels), the crowd are swept up and along in the band’s thrilling and uncompromising world. 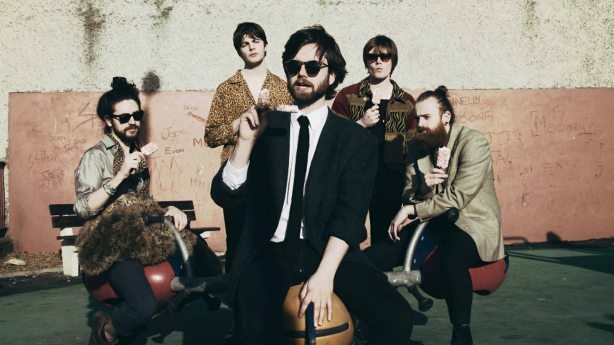 As the set begins to draw to a close Fontaines DC roll out the big guns – Hurricane Laughter is a repetitive, addictive barnstormer like punk smack, and the feral, frenzied Boys In The Better Land is, if anything, even better. Finally, latest single the needling, provocative Too Real ends the show with a flourish of pogoing and (sober) sing-a-longs to the chorus. Behind me weighty tomes hurl themselves unbidden from the shelves. For them its all been too much, a library is no place for such shenanigans, but for the rest of us, Fontaines DC have just given us the clearest possible indication, and vindication, that they’re the real deal.